Commemorating the centennial of the end of World War I Director Peter Jackson was charged with the making of a unique documentary around the event. Culling through hours upon hours of never before seen footage and narrated by historical interviews from veterans who were there, the end result is a haunting and beautiful tribute to the men (often 15 to 17 year old boys) who served. Furthering the experience, with footage that’s now been retouched, restored, and colorized using technology of today, audiences are now able to see and feel the emotion, humanity, and insanity surrounding the war in a truly moving and impactful way. Important to point out, this isn’t the kind of documentary that hangs on numbers, dates, and statistics, but instead aims to capture the feel and ambiance– a different but also incredibly important method of historical storytelling. Also of note, the first 10 to 15 minutes of the film is in original black and white, but then, once the audience is fully induced and the stage is set, the real magic of the restoration work becomes apparent, it’s worth the wait. 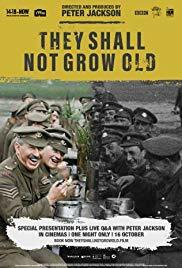 Worthy of your time and definitely worth checking out, They Shall Not Grow Old is rated R.